There are seasons of Life when things seem bleak and cold. We lose a job we've had for years, or the kids are all gone and we seem to have lost our way - maybe even our purpose. Whatever it is in your life, I painted this painting for you. In this final painting of the Seasons of Life series - "A Time to Rest," the momma bear no longer has her cubs to take care of; her work is done. A cold blanket of fresh snow has covered her world, the chill of the winter wind is creeping in, and life seems undesirable. I've had times in my life like this. I didn't want to get up and start a new day because something so bad was looming in front of me, that I could not face it. One such occasion, during a cold winter day, I was lying on my bed looking out at the bleak landscape feeling full of despair and hopelessness. I asked God what He wanted me to know about what I was believing. Within a couple of seconds, a red bird flew down into our courtyard and flitted around drawing my attention to some withered and frozen plants that always come back every spring and I had the thought, "this season won't last." And just like that, as if a warm day had arrived, I was filled with hope and rose up to face my world with joy. "Thank You, God!" 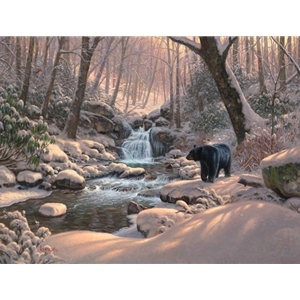 Notice in this painting, where the warm light washes over the cold snow, I am drawing you in with the shadows that lead to the mother bear, and with the turn of her head looking at the new arrival in the tree across the stream, the painting speaks, "the adventure is still going!" Rise up and be filled with joy.